Rove praised Obama's economic team. (CNN) - President-elect Barack Obama is drawing early praise from former top Bush-aide Karl Rove. Rove, widely credited with orchestrating President Bush's two successful presidential campaigns, writes in a Wall Street Journal op-ed that Obama has assembled a "first rate" economic team that has "provided surprisingly positive clarity." Specifically, Rove praises Obama's choice of New York Fed Chairman Timothy Geithner for Treasury Secretary and Obama's pick of Larry Summers, the former Treasury Secretary and President of Harvard University, as chief of the National Economic Council. "Monday's announcement of Mr. Obama's economic team was reassuring," Rove writes. "He's generally surrounded himself with intelligent, mainstream advisers. Investors, workers and business owners can only hope that, over time, this new administration's economic policies bear more of their market-oriented imprint." Rove also offers praise of Berkley Economics Professor Christina Romer as Obama's choice to head up his team of economics advisers. 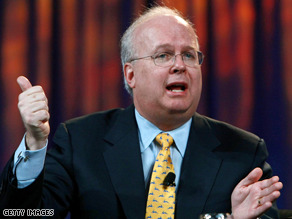 But Rove criticizes the choice of Melody Barnes, a former aide to Sen. Ted Kennedy, as Domestic Policy Council Director. "Putting a former aide to Ted Kennedy in charge of health policy after tapping universal health-care advocate Tom Daschle to be Health and Human Services secretary sends a clear signal that Mr. Obama didn't mean it when his campaign ads said he wouldn't run to the "extremes" with government-run health care," Rove writes. Rove is the the worlds biggest idiot. He's excellent at kissing butts! OMG! There have been many poitive signs from candidate and now PE Obama.....many good ideas and policy plans. I agree with most. But this Rove thing is the first sign that Obama might be wrong about something afterall. Well here's hoping maybe Rove is correct for once - even a blind pig finds an acorn once in awhile. What is this "extremes" business Rove is talking about? Obama has said he would pursue universal health care, so he is putting in people who advocate – duh – universal health care. "Rove" he (Barack) is not a perferct man! This guy is one of the most deceiving human beings.. Now he wants to come clean saying that he thinks that Mr. Obama has a great economic team.. He would say anything to give the impression that he is a man of integrity and fairness. This is another parasite that has its place in history with bush and cheny for making a mess of this country. All of the and all the self righteous hypcrite repubilcans were more concerned about putting their political ideology before the interests of the country and the people. This guy, same as bush and cheney has no conscience and I don't think they will miss a night of sleep thinking what they did to this country. Rove.. should crawl under a hole and do us a favor.. we don't want see your face because parasites look better than you. It is spelled Berkeley not Berkley. who cares what that fat idiot thinks???? Thanks Mr Rove for your comments by stating the truth. Too bad you could not be truthful before the financial disaster that we are faced with in the present administration. Glad Rove feels better.. about it.. would not want him uncomfortable. Rove, the damage you've done to this country can not be undone. Stop trying to save your own legacy. You will go down in history as a corrupt, soulless, fat pig. six years – and he's critiquing Obama's moves??????? "He's generally surrounded himself with intelligent, mainstream advisers." That's just crazy enough to work, huh, Karl?